Jack Forstein will compete in Scotland later this month. Seven-year-old Jack Forstein, a second grader at Moorestown Friends School, practices his swing at the Laurel Creek Country Club. Jack will compete at the 2017 U.S. Kids Golf European Championship beginning May 30. Five years ago, Bradd Forstein looked out his kitchen window and saw his 2-year-old son Jack pick up a golf club and deliver a perfect swing. Today, Jack, now 7 and in second grade at Moorestown Friends School, is gearing up to leave the country for the first time to attend the 2017 U.S. Kids Golf European Championship. While Jack competes frequently in local tours, this is his biggest competition to date. He qualified for this prestigious international tournament by competing in a number of U.S. Kids Golf tournaments during the 2016 season and consistently placing in the top five for his age division. Jack has earned his U.S. Kids Golf status for the 2017 season, giving him the opportunity to play in a number of national and international tournaments this year. Jack is currently playing in the U.S. 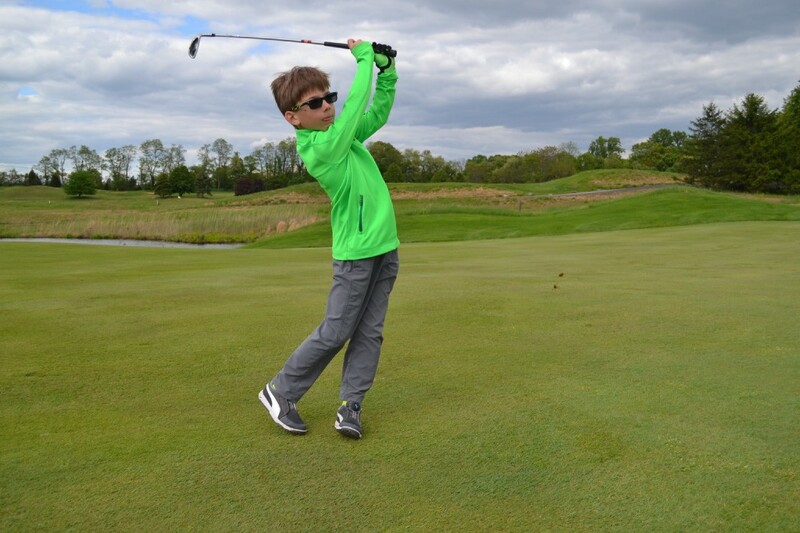 Kids Golf Central Jersey Tour. In addition to serving as Jack’s “support staff,” Randee also is Jack’s equipment manager, snack supplier and fashion coordinator. Bradd, on the other hand, is what Jack calls his “daddy caddy.” He can’t recall ever missing a match since Jack started competing two years ago. He helps Jack as much as he can on the course, but saves coaching for the professionals. “It’s more just guiding and being supportive and being a dad and making sure I carry the bag,” Bradd said. Jack’s older brother, Max, started golf at a young age as well, and Jack would ride around with his dad in the golf cart at Max’s competitions. Not long went by before Jack started subbing in for kids twice his age. When he was 4, he enrolled in the PGA Junior League. Bradd has loved golf since he was a kid, and while he hoped his kids would share his love one day, he says he never pushed them. Jack will be one of fewer than 10 7-year-olds in the nation to compete in the U.S. Kids Golf European Championship, which will take place from May 30 to June 1. The competition, which is held in Scotland, is the second-largest junior golf tournament in the world and will take place over six golf courses. More than 800 kids from 52 countries will compete. “I get to go to Scotland to play golf with my 7-year-old,” Bradd said in awe, before laughing in realization that he’ll be there to caddy, not to play. He anticipates this will be the first of many international tournaments Jack will attend. Bradd said the biggest challenge thus far has been getting Jack to actually want to learn. Jack, who also plays flag football, basketball and karate, is looking forward to meeting new friends from all over the world, namely Turkey and Jordan. The part he’s most excited about, though, is getting to wear a suit jacket at the formal club house. “To shoot under a 36,” Jack said when asked what his goal for the nine-hole tournament is. He usually shoots between 38 and 44, so this won’t be an easy feat. One thing is for sure — he’ll be listening to his theme song, “Mama Said Knock You Out” by LL Cool J, before he hits the course.